Feeling a bit rubbish today, but can’t tell if it is the Paleo transition or the cold, or both. I skipped coffee this morning and had a lemon water to sooth the sore throat. 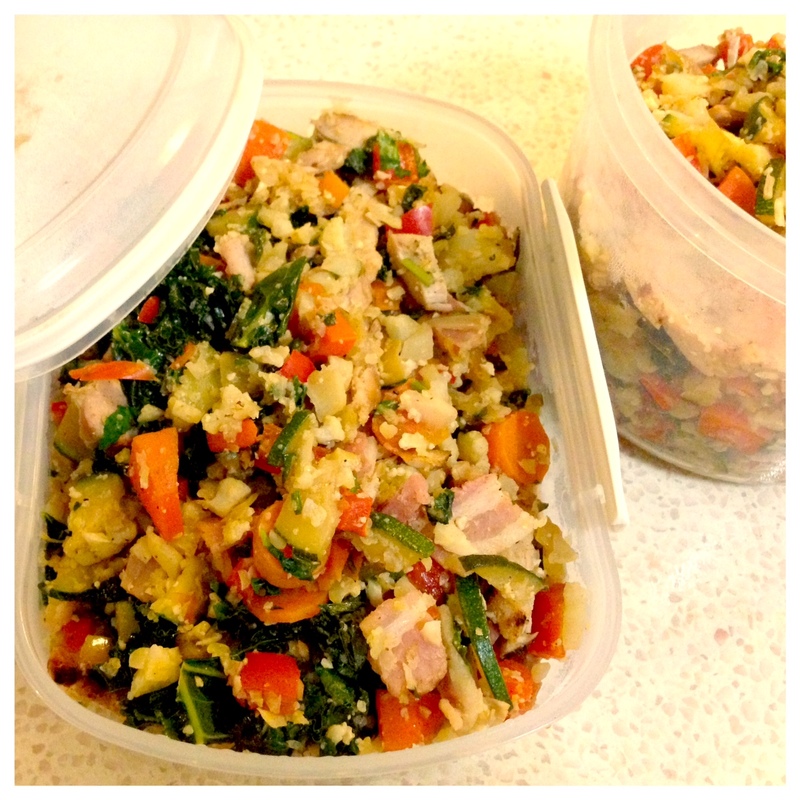 Then made a mish mash hash of ham, zucchini, spinach, tomato and 1x egg (last one left!). Was pretty tasty, but hungry again by 10.30am. A friend has borrowed my copy of It Starts With Food – must get it back and work out what I need to add to curb the hunger – extra fat? extra protein? Lunch was left-over Moussaka again – yum! I have been thinking a lot about taking up CrossFit, but I need to arrange to cancel my gym membership, and I’ll also a bit nervous of diving in. I’ve had an annoying ache in my hip the last few days which I haven’t had for over a year when it was a lot worse and I received physio and cortisone to treat the inflammation. Also as I’ve been feeling a bit ill, the motivation to hit the gym is just not there. Last night I pushed through a Pump class but had zero energy the whole way through. Really want to get involved in CrossFit though and drive this body to get stronger. Dinner was faux fried-rice with bacon, chicken and lots of veg – yum! Packed up a container for lunch tomorrow too. Previous Post Whole30 – Day 2: Sick? Hungry! From the looks of your breakfast, probably more fat. I think you got an adequate amount of vegetables. If i dont eat enough veggies, I get hungry by 10:30. Did you cook the mish mash in coconut oil? Maybe grab some nuts after breakfast.